Download and print the drilling template. 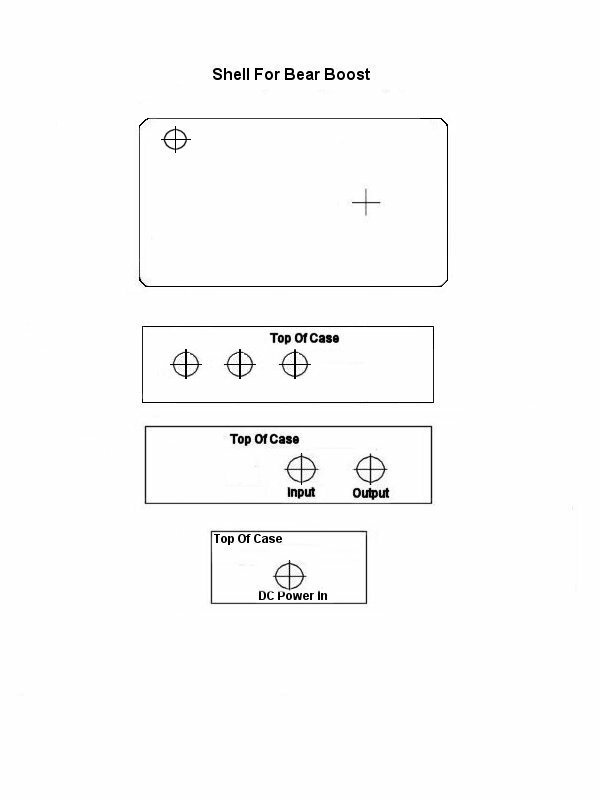 With a sharp scissor, cut out the piece for the top of the case. Using double-sided transparent or masking tape, attach the template to the case. 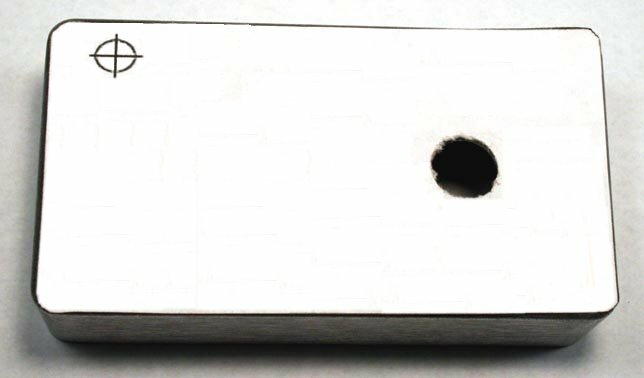 Using a scribe or center-punch, mark the centers of the holes for the stomp switch and the LED Bezel and drill them. I used a Unibit for this, but regular twist drills are also fine. The hole sizes are 1/2" for the switch and 5/16" for the LED Bezel. In similar fashion, cut out and attach the templates for the side holes for the potentiometers, input and output jacks and external power jack. Drill these holes. The completed piece is shown below. Put the case down for now and tool the circuit board. 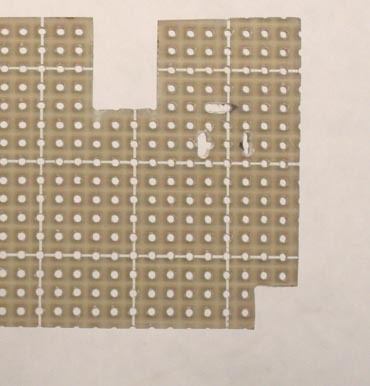 Start by cutting a rectangular piece exactly 27 holes by 18. You can use any combination you want of cutting, scoring or grinding to do this. The pics below show part of the process of a score-and-snap using knife, steel rule and locking-grip (Vise-Grip) pliers. A file or sanding block is used to smooth the cut edges. Now tool the board to fit in the enclosure. Start by cutting out the lower right corner with a hacksaw or Dremel tool, and file smooth. Be sure that the cutout clears the mounting boss cleanly. Then do a score-and-snap on top to leave an area for a mounting hole at the top left. Mark off and bore the two 1/8" mounting holes. If you are using Alpha RD09 series pots, the contacts will go in the second row of holes in from the mounting panel. The center pin of the rightmost control should go in hole 5 from the right. The other two pots center on holes 12 and 20 respectively. Set the pots in place by hand to start, and eyeball the horizontal registration. If the registration is good as shown in the pic, you can proceed with fixing the position of the board. If the registration is off, you may be able to salvage the job with some filing. Making sure that the pins are in their correct holes and that the bottom of the control is flush to the board, solder in place the center contact of each pot. Slip the board in place, and scribe a mark where each mounting stud will rest. I used 1/8" studs in this build so that I would have use of every millimeter of board space. Screw a mounting stud and a 4-40 screw into each mounting hole. Again slip the board in place, screw washers and nuts finger-tight to the pots, and eyeball the vertical registration. You want the board to be as close as possible to exactly parallel with the floor of the enclosure. Depending on how precise your drilling was, you may or may not need to file the mounting holes slightly larger to achieve this. Once the registration is correct, remove the board from the enclosure. Clean the marked location of each stud with 220 grit carborundum paper and then wipe clean with acetone. Clean the studs with a Q-Tip wetted with acetone. Mix a small amount of quick-setting epoxy cement and apply a small bead to the mounting location of each stud. Slip the board in place carefully. Slip the washers and nuts on the pots, but finger-tight only. Let the epoxy cure for several hours. When the epoxy has fully cured, remove the screws from the board and the washers and nuts from the pots. Lift the board out gently and reinforce the mounting of the studs with more epoxy. Again, let the epoxy cure fully before proceeding. Use a Sharpie to mark the cutouts for the flanges of the jacks. I used a small hacksaw to make the vertical cuts and broke off the inside piece with a locking-grip plier. If you cut with a Dremel tool, WEAR GOGGLES! Use a flat file to smooth the edges of the slots. Reassemble the shell, install the jacks, and be sure that the flanges move freely when a plug is inserted. The last step is cutting slots in the board for the contacts of the power jack so that you know it will be positioned correctly at final assembly. You can do this by boring successive holes with a #63 drill, though a diamond burr in a Dremel handpiece makes it easier to do a neater job. Your shell is finished and is ready for painting and decorating! I hope you found this article useful, and I welcome comments and suggestions at smallbearelec@ix.netcom.com.